At many bakeries, these simple breakfast treats are made for the early-morning staff using day-old brioche. 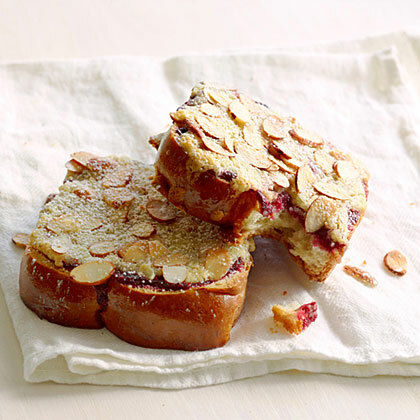 A rich baked almond cream covers the toasts, and sliced almonds on top add buttery crunch. Preheat oven to 350°. Whirl 1 cup almonds with 1/4 cup granulated sugar in a food processor until finely ground. Transfer mixture to a bowl. Blend butter and remaining 1/4 cup granulated sugar in a food processor until smooth. Add salt, egg, and half-and-half and pulse just to blend. Add reserved ground almonds and blend until mixture is smooth. Line a baking sheet with parchment paper. Spread about 1 tbsp. jam, then 2 tbsp. almond cream, on each slice of bread (you'll have almond cream left over). Sprinkle each with about 2 tbsp. sliced almonds. Bake until almond cream is golden brown and almonds are toasted, about 20 minutes. Sprinkle with powdered sugar. Make ahead: Chill extra almond cream airtight up to 2 weeks and use for making more pastries (you'll want to).